Recently restored perigordian cottage with a 9x4 metre terraced and floodlit pool, set on high ground and bounded by apple orchards, valleys and woodland. An idyllic and peaceful setting offering superb valley views, tranquillity,romantism and charm. 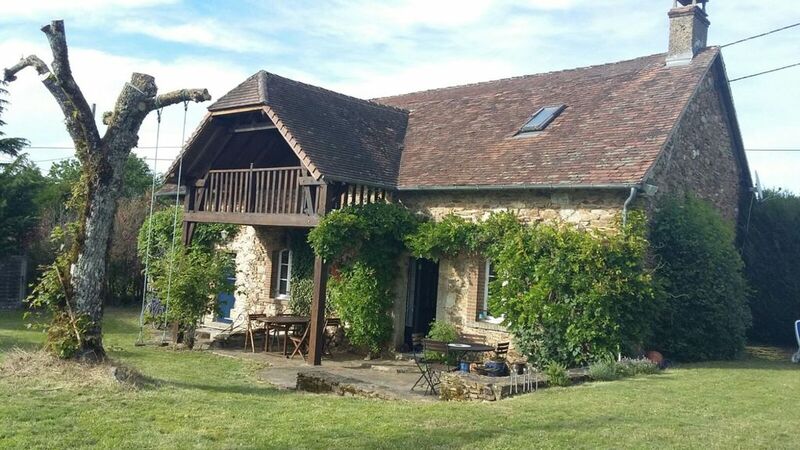 The cottage is a perfect base to relax and/or explore the region with it's varied programme of cultural events, exhibitions, markets, fairs and fétes. The immediate area: The cottage is situated in the NE Dordogne, the Perigord Vert, famous for it's wonderful food and scenic vistas. Many beautiful places rich in historic value are within easy reach, we are just 3km away from one of it's superb sites 'la vallee de l'lsle' above the gorge of this river stands a majestic castle dating back to the XVI century. It is an outstanding example of chateaux to be found in the Dordogne. The village has made it's best for you to enjoy this attraction. St.Yrieix La Perche, Thiviers, perigueux: The market towns of Thiviers and St.Yrieix-la-perche are just 15 mins drive away and the larger towns of Limoges and Perigueux the capital are approx. 45kms distant. Brantome,' la petit venise de la Dordogne' takes just 30mins. We are approx. 2hrs45mins from Bordeaux and 6/7hrs from Calais. A dayboat and overnight stop in the Loire makes for a very pleasant journey. St.Yrieix-la perche, the nest of 'la Porcelaine de Limoges' will offer you anything you need like supermarkets, hospital, many shops, bars and restaurants. You will find here a lovely medieval town famous as well for its cuisine. We are also close to many lakes. Leisure activities: In many surrounding towns and villages you will find plenty of sporting activity such as tennis, fishing,excellent canoeing, horseriding, windsurfing, golf in Limoges and Perigueux and even panning for gold in Jumilhac le Grand. There are numerous restaurants to satisfy the palate of any aspiring gourmet and several night clubs to enjoy. If you like romanticism and impressionism you will like the cottage charm and location. But whether you know France or not you can enjoy your holiday in relaxed or active mode surrounded by scenic beauty, friendly shaded cafés, memorable restaurants and an ambience to remember. Wi-fi provided which up to 6 guests can use at same time. Newly fitted kitchen with all mod cons including washing machine, tumble dryer, microwave, fan oven, freezer and Smeg fridge. Dining table in kitchen which sits 6/7 comfortably. Additional dining table in lounge area which will sit 8 people. Large fenced one acre garden. Fantastic view from balconey over the surrounding valey and orchards. 9x4m private in ground pool with alarm. In addition to the swimming pool we have several terraced areas with table tennis,petanque,football, badmington and a large garden salon with seating for eight, two parasols,two barbeques one gas and one charcoal, garden furniture and sun loungers. All rooms are equipped with ventilator fans and electric radiators. Kitchen and bathrooms with extractor fans. There is also freeview satellite TV and a large selection of DVD films. The cottage is maid serviced on changeover dates. A great cottage set amongst lovely surroundings with views overlooking the countryside. Fully equipped with modern appliances for all cooking and clothes washing, good sized pool, sports / entertainment equipment. Property is rustic with good sized rooms throughout. A good central location within the Dordogne area with numerous attractions nearby. Thanks for your kind comments. The new kitchen has been a great addition to the cottage. As you say it is a great location for exploring the region and returning to for a nice relaxing evening. Hope you will stay with us again. We are situated in the North east Dordogne, Aquitaine, close to the perigordian capital of Perigueux and the very beautiful brantome, appropriately called 'the venice of the dordogne'. We are also also perfectly situated to explore the tresors of occitania with its rich cultural and historical buildings, chateaux and bastides. The Atlantic coast is just 2-3hours distant by car. There are also many local lakes within easy reach offering a wide range of water sports and other facilities including dining. or Limoges, all within equal distance of under one hour drive. 19th hole and restaurant inclusive. All equipment provided.